A school with one of England's worst truancy records plans to offer pupils teaching around the clock. Bridgemary Community Sports College, in Gosport, Hampshire, is to open from 7am to 10pm and offer lessons via the internet throughout the night. Head teacher Cheryl Heron said it was hoped pupils who did not respond to classroom lessons would be stimulated by online learning. The Department for Education said it would closely monitor the scheme. A spokesman said: "We are keen to encourage initiatives designed to raise levels of achievement in school, such as the implementation of personalised learning." Mrs Heron joined the school in 2001, when Bridgemary was classed as a failing school and had only 19% getting five or more good GCSEs. 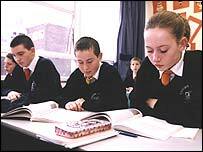 In 2005 the school, which has ability-centred no-age related classes, was identified by the Department for Education and Skills as being among 148 nationwide which were likely to have a "high number of persistent truants". The 24-hour teaching project is planned to run for two years from next September. Mrs Heron said she had the support of teaching and administrative staff at the school, who would work flexi-time under the scheme. Teaching unions will be consulted as part of a renegotiation of pay and conditions. The practicalities of the project are still being worked out but the general aim is that, with guidance, pupils will be able to develop a personalised learning program. Teaching and extra-curricular activities would take place from 7am to 10pm and learning modules would be available online at any time. Mrs Heron said it would see the end of the traditional school year - something she felt would benefit both staff and pupils. "It would be completely flexible," she said. "At the moment staff are tied to working school hours during school term time but with this system there would be other options. "Another important thing to remember is that a lot of people are taking holiday during term-time and missing out on schooling. "With this they could structure their year so they still get their full 190 days of education." She said the project was an example of schools changing to meet the needs of children rather than forcing the pupils to fit in with education conventions. "There's a lot of disaffection and we often expect students to learn in one way but there may be other issues going on in their lives," she said. "There is also scientific evidence that different people study at different times - some people simply don't respond to learning in the morning." She said the real reason many children played truant was boredom. "It is a sad fact that we are one of the schools with a truancy problem so we are looking at ways of addressing this. "One issue is that some pupils come from families where education is not seen as important. "Another part is that children are demotivated or disaffected so are are looking at ways of changing this and we have already seen a drop in truancy rates." Since Mrs Heron took over the school the GCSE success rate has risen to 35%, while truancy has fallen by three percentage points. "Some people simply learn better at different times than others, so why should children be forced into a situation where they have to learn between 9.30am and 3.30pm? "We know we have a problem with attendance and we do not try to hide from it." She added that most university students did their work at night "or even the small hours of the morning". Next phase for getting the project in place is to work out the practicalities with help from a DfES consultant and pilot the scheme with different groups of pupils. If this works it would be rolled out across the school next September. How much of a helping hand?